Are you trying to find ways to spice things up? 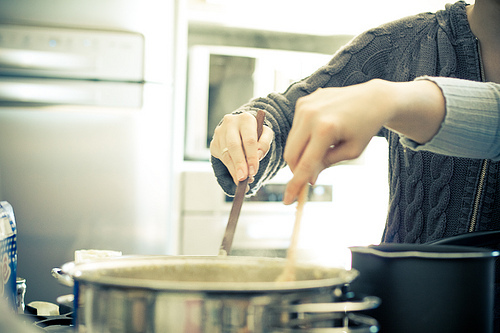 Why not make a home-cooked meal with your guy? Any of these easy recipes are sure to satisfy his taste buds and put a fun, new twist on date night. If you’re dating the “All-American” kind of guy, stick to the classics, and prepare a good old- fashioned cheeseburger with his favorite kind of chips, and top it off with an ice cream sundae for dessert! *It can be garnished with a sliced pickle or store-bought potato salad (your local grocery store deli will most likely have something delicious and fresh; make sure to ask for a pound). 1. Preheat a frying pan to medium-high heat. You’ll know the pan is at the correct temperature if a drop of water on the pan dances on its surface rather than sticking to it. Note: There’s no need to use oil because of the ample amount of fat in the patties. 2. Once the pan gets hot, you can sprinkle in some salt and pepper, too if desired. 3. Then, place the frozen patties on the pan. Make sure they don’t thaw before putting them on the pan. 4. It will take around six minutes for the patties to cook. Cook on one side for about three minutes and then the other for the same amount of time. The patties will turn a brownish color when they are close to being done. 5. Once the patties are cooked, reduce the temperature to low, place slices of cheese on each and cover the frying pan with a lid. Watch the cheese, and once it’s melted, remove and prepare to serve. Any other toppings, such as mini M&M’s, cookie dough crumbles, crushed up Oreo’s, etc. 1. During dinnertime, take the ice cream out and let it thaw for a bit to make it easier to dish out. 2. After dinner, scoop a healthy portion of hot fudge in a microwave-friendly bowl and heat it for around 30 seconds. 3. Pour on top of ice cream, sprinkle toppings and serve! If your guy is more of the “Edgy-Cool” type, make him a homemade pizza (what could be more romantic?) with fresh bread and Dove ice cream miniatures garnished with fresh-raspberries for dessert. *Toppings are subject to change with your and your guy's preferences (example: if he’s a meat-lover, pepperoni only, veggie lover, etc.). When you’re making your grocery list, take into account what his favorite toppings are. 2. While you’re waiting, clean off a surface to roll out the dough. 3. Knead and pull the dough to flatten it into the shape of a pizza pie. Make sure you’re not too aggressive with it because the dough may tear. 4. When you get it to be the shape you want, place it on a baking sheet and start spreading the sauce. Pour a good amount of sauce onto the center of the crust and then use a spatula to spread the sauce from the inside out. Be sure to leave about an inch of sauce-free dough around the outside edges for the crust. 5. Sprinkle both types of cheese on top of the sauce. This could be fun for the two of you to do together and that way, he can add as much cheese as he wants. 6. Top it with pepperoni, sausage, veggies or whatever else he prefers. If there’s something you are super opposed to having on your pizza, you can always make it half and half. 7. Place it in the oven, and set the timer for around 20 minutes. Make sure to continuously check the pizza and remove it whenever you think it’s ready. 8. While you’re waiting for the pizza to cook, slice up the fresh bread and serve it with oil and vinegar for dipping. 1. After dinner, unwrap the Dove ice cream miniatures and display them nicely on a plate. 2. Then, garnish them with a sprinkling of fresh raspberries. If your guy’s more of the “Eclectic Vegetarian” type, try making quinoa, a grain that contains essential amino acids. Accompany it with black beans and chopped red peppers, a Caesar salad, and complete it with a chocolate chip cookie ice cream sandwich for dessert. 1. For directions on how to prepare the quinoa, view the back of the package. They take you through an easy step-by-step process to follow. 2. While you’re waiting for the quinoa to cook, drain the black beans and make sure to rinse them, and then chop up the red peppers. 3. Fix up the salad. The dressing, croutons and cheese are all included in the bag. 4. When the quinoa is done, stir in the black beans and red peppers. Then you can add the salsa as a sauce to the quinoa concoction if desired. *This is best done a few hours before dinner so the ice cream has time to freeze again. 1. With the ice cream thawed, take one cookie and spoon in a substantial amount of vanilla ice cream. Spread it thick with a knife, so that it covers the entire surface of the first cookie. 2. Place the second cookie on top to finish the sandwich. You can take a knife around the edge of the cookie to smooth out the ice cream on the sides. 3. Package it tightly in saran wrap and put it in the freezer for later. Whatever kind of guy your man is, he’s sure to like one of these scrumptious concoctions! So get cooking! Leave a comment to let us know what recipe is your favorite. WOW! This is a great idea for date night!! I can't wait to try these recipes with my man!! Thanks for the tips!! Cool article! I am totally going to make the quinoa salad for my bf tonight!